Making pickled red onions is easy and quick! A delicious addition to sandwiches, burgers and more, these quick pickled onions only require 4 ingredients (all of which are pantry ingredients) and take only a couple of minutes to throw together. How do you store pickled red onions? How long do pickled red onions last? 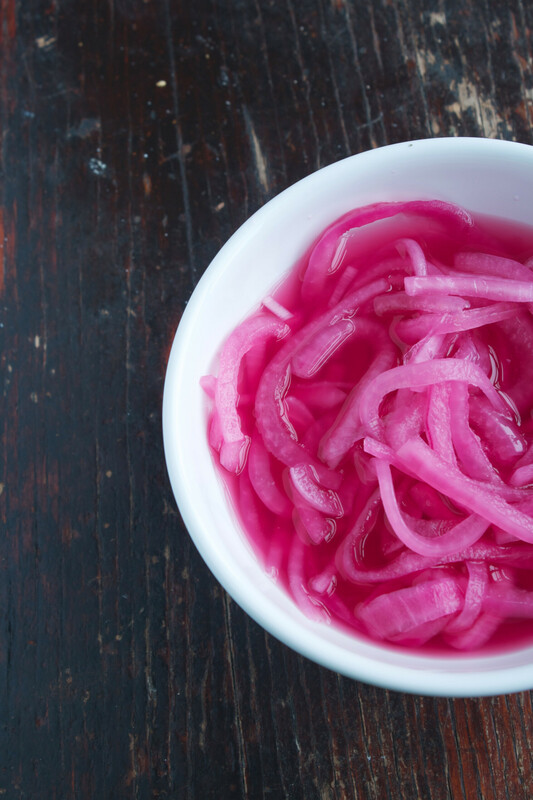 Stored in the refrigerator, homemade pickled red onions can last up to 2 months. Although they are best within the first month. How do you make pickled red onions? There are three basic components to making pickled red onion. I prefer using white distilled vinegar because it gets the job done and is a nice blank slate, allowing you to add whatever flavorings you’d like. You can also use red or white wine vinegar, champagne vinegar, or rice vinegar. In general, I prefer to use natural sweeteners when I cook such as honey and maple syrup. For pickled onions I often use honey but you can use agave, raw cane sugar, white or brown sugar, brown rice syrup, and more. Although not necessary, you can add a variety of flavorings to your pickles red onions. Crushed garlic, dried bay leaves, black peppercorns, pepper flakes, citrus zest, and whole cloves or cinnamon sticks are common additions. How do you serve pickled red onions? Add them to your favorite burger, like these Turkey Burgers or Veggie Burgers. Serve them on these Greek Nachos. Add them to sandwiches such as these Turkey, Peach & Basil Sandwiches. 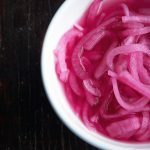 Pickled red onions are quick and easy to make and are a delicious addition to sandwiches and burgers! Place onions in a medium bowl. Combine vinegar, honey, and salt in a small saucepan over medium heat. Bring to a boil, remove from heat, and pour over onions. This post contains affiliate links, thank you for supporting the brands that ZK loves!